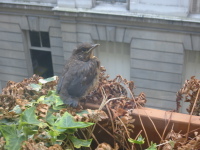 The baby blackbirds whose nest is on my kitchen balcony learned to fly yesterday. In the morning as I had my coffee I pulled the curtain back and cautiously looked down into the nest. It was empty! Then I spied the little birds next to it. They had hopped out and were huddled together in a corner of the planter. I sat down to have breakfast and suddenly I saw a little whirr of wings. The bravest little one flew up to the edge of the planter! Then it flew to the other side, close to my window. I didn't dare move. It flew back again. A little while later the mother blackbird came back and I saw her feeding them. In the evening, the nest was empty. Even the unhatched egg was gone. I hope the little birds are safe! I feel quite sad that they're gone already. They hatched only two weeks ago.